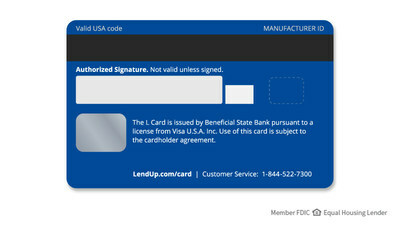 SAN FRANCISCO, May 16, 2017 /PRNewswire/ -- LendUp, a socially responsible lender for the emerging middle class, and Beneficial State Bank (Beneficial State), a social enterprise bank, today announced a significant expansion of the L Card, its credit card joint venture. The move is expected to quadruple the availability of L Cards, a Visa credit card product designed by LendUp and issued by Beneficial State for consumers traditionally shut out of mainstream banking due to poor credit scores or damaged credit files. The expansion builds on the firms' partnership that extends back to the L Card pilot in April 2015. "It's uncommon to find a fintech startup and a bank who are so completely aligned on the same North Star, but that's exactly the case with LendUp and Beneficial State. Like LendUp, Beneficial State is committed to expanding consumer credit access in a socially responsible way, and we're proud to call them our partner," said Sasha Orloff, LendUp co-founder and CEO. "Our partnership is a perfect example of bringing our house-built technology, product design and educational experiences to bear for a similarly mission-driven bank and well-deserving consumers across the country." 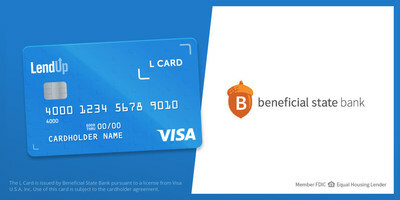 "We're so pleased to be the issuing bank for the L Card," said Daniel Skaff, president and co-CEO of Beneficial State Bank. "As a triple bottom-line bank and certified B Corp, it's critical that we work with fintech partners who share in our commitment to innovate, learn and build the long-term prosperity of responsible, deserving consumers -- and we've found just such a partner in LendUp." According to the Credit Builders Alliance, a person with subprime credit pays on average $250,000 more in interest than borrowers with good credit over the course of their lifetime -- and that doesn't even include fees on financial products. In addition, according to LendUp research, many of its own customers are currently shut out of mainstream credit card products, such as rewards credit cards (98.5%) and retail rewards cards (66.5%). The L Card carries an annual fee of $0-$60 and APR ranging from 19.99% to 29.99%; it has a 4.8 average star review on CreditKarma. "There's a huge addressable market, estimated at about $350 billion, for credit cards that serve consumers with credit scores below where a bank usually draws the cut-off line, at 680," said Orloff. "As a mission-driven company, we've built our business by putting the customer first -- that means house-built technology, embedded education, and safe, no-gotcha products. We are proving we can re-imagine credit products for the emerging middle class that make a positive impact on our customers' lives. With Beneficial State, we're more than ready to take it to the next level with the L Card expansion. Between our technology, product innovation and mission, we will continue to completely reimagine what had previously been known as the 'subprime' category and become these deserving borrowers' financial services partner of choice." The news comes on the heels of LendUp announcing $1 billion in loan originations and a $100 million credit facility with Victory Park Capital in March, which will help fund the company's future growth. LendUp's mission is to provide anyone with a path to better financial health. Through its proprietary software, it designs safe, transparent products that expand access, lower costs, and provide credit building opportunities for the 56% of Americans who currently have limited options within the traditional banking system because of low credit scores and income volatility. It is backed by more than $325 million in equity and debt financing from investors including Google Ventures, Victory Park Capital, Y-Combinator, QED Investors, Susa Ventures, Data Collective, Kleiner Perkins, Andreessen Horowitz Seed Fund, Kapor Capital, Yuri Milner, Thomvest Ventures, Bronze Investments, and many others. Beneficial State Bank is a state-chartered, deposit-taking, federally insured, for-profit banking organization headquartered in Oakland, Calif. Founded as a social enterprise bank in 2007, Beneficial State Bank has grown organically and through aligned acquisition to serve the three West Coast states. Beneficial State Bank holds to a triple bottom-line of social justice, environmental well-being, and economic sustainability. One hundred percent of the economic interest of Beneficial State Bank is entirely owned by the nonprofit Beneficial State Foundation that is permanently governed in the public interest. This ownership has allowed the bank to prove and maintain an innovative model for banking that generates prosperity for people and the planet, avoids extractive practices, all while being financially safe and sound. Beneficial State Bank entered the Portland marketplace in 2010 with the acquisition of ShoreBank Pacific, a pioneer of environmentally sustainable banking serving both Washington and Oregon. In 2013 Beneficial State Bancorp completed a stock purchase transaction of 90 percent of Albina Community Bank to provide critical capital for a legendary Portland institution. In June of 2016, Beneficial State Bank acquired Pan American Bank to serve communities in the Central Valley and Los Angeles markets of California. Today the combination of Beneficial State Bank and Albina Community Bank have $856 million in assets, 225 colleagues, and 17 locations in California, Oregon and Washington. Albina Community Bank and Beneficial State Bank are both certified B Corporations, with Beneficial State Bank ranking among the world's top B Corps since becoming a certified B Corporation in 2012. For additional information, visit http://www.beneficialstate.com.